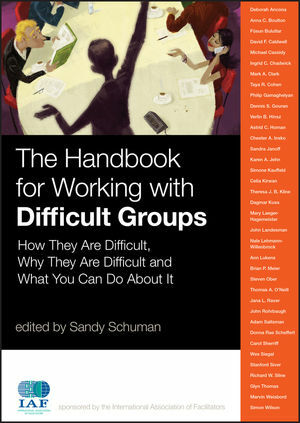 WE'VE ALL EXPERIENCED the challenges associated with working with groups, but The Handbook for Working with Difficult Groups turns the idea of "difficult groups" on its head. Rather than view groups as inherently difficult, it looks at the factors that make working with groups difficult. Individual chapters focus on challenges such as involving dissenters, building external perspectives, reducing complaining, adapting to cultural differences, incorporating diversity, facilitating inclusion, working virtually, resolving identity-based conflict, transforming unproductive behavior patterns, preventing workplace harassment, and strengthening accountability. How the group is difficulta description of a real group and the observable phenomena that reflect the group's difficulty. Why the group is difficultan exploration of the underlying causes of the difficulty. What you can do about itwhat you can do as a group facilitator, leader, or member to help the group. Sandy Schuman has been helping organizations work more effectively to solve complex problems and make critical decisions for more than thirty years. He is a group facilitator, collaborative process advocate, and storyteller. He helps groups create shared meaning, make critical choices, and build collaborative relationships. He facilitates problem-solving and decision-making processes for a wide variety of public management and policy issues and provides training in group facilitation, decision making, systems thinking, conflict management systems, and organizational communication. He is the editor of the International Association of Facilitators handbook series: The IAF Handbook of Group Facilitation, Creating a Culture of Collaboration, and Working with Difficult Groups. Introduction: Working with Difficult Groups: A Conceptual Framework. Make sense out of what makes working with groups difficult (Sandor Schuman and John Rohrbaugh). 1 Keeping Difficult Situations from Becoming Difficult Groups. Dissenters need support, or the group risks going off track (Marvin Weisbord and Sandra Janoff). 2 Building an External Focus: Avoiding the Difficulties on an In-grown Team. The critical importance of an external perspective (Deborah Ancona and David F. Caldwell). 3 The Downside of Communication: Complaining Cycles in Group Discussions. Help teams get out of the “complaining loop” and turn to solution-oriented interaction instead (Nale Lehmann-Willenbrock and Simone Kauffeld). Customize structures and processes to match groups' cultural preferences (Donna Rae Scheffert and Mary Laeger-Hagemeister). 5 Interpersonally Hostile Work Groups: Precipitating Factors and Solutions. A group perspective on workplace harassment and bullying is essential to understanding and preventing it (Jana L. Raver and Ingrid C. Chadwick). 6 Diversity by Design: Creating Cognitive Conflict to Enhance Group Performance. Ill defined, diversity might undermine its purpose (Michael Cassidy). 7 Facilitating Inclusion: Study Circles on Diversity and Student Achievement. Bridging differences in culture and ethnicity can foster academic achievement (Mark A. Clark and John Landesman). 8 Overcoming Sources of Irrationality That Complicate Working in Decision-Making Groups. Six factors make working with this group difficult in many different ways (Dennis S. Gouran). 9 Working Without Rules: A Team in Need of a Different Picture. Affirmative language encourages new views of a team's past and future (Ann Lukens). 10 Interaction Archetypes: Keys to Group Difficulty and Productivity. Identify the repetitive behavioral sequences that reduce a group's ability to produce results (Steven Ober). 11 Virtual Teams: Difficult in All Dimensions. Group members working virtually and interdependently face enormous challenges (Thomas A. O’Neill and Theresa J. B. Kline). 12 Politics of the Arts: Challenges in Working with Nonprofit Boards. A “confessional tale”—lessons learned while facilitating an arts board in transition (Richard W. Sline and Anna C. Boulton). 13 Competitive Group Interactions: Why They Exist and How to Overcome Them. Groups are less cooperative than individuals—learn how you can reduce intergroup conflict (Taya R. Cohen, Brian P. Meier, Verlin B. Hinsz, and Chester A. Insko). 14 Active Facilitation: How to Help Groups Break Through “Mutual Stalemate”. Groups may abdicate their responsibilities waiting until another group makes the first move (Celia Kirwan and Wes Siegal). 15 Mediating History, Making Peace: Dealing with the “Messy” Stuff in the Conciliation Process. Identity-based conflicts will not achieve long-term solutions through resource-based settlements (Dagmar Kusa, Adam Saltsman, and Philip Gamaghelyan). 16 Deep Democracy: Multidimensional Process-Oriented Leadership. Learn to track the shifting roles of group members (Stanford Siver). 17 Authentic Relationships and Collective Psychological Capital. How leader behavior can undermine group success (Füsun Bulutlar). 18 How Leaders Can Make Diverse Groups Less Difficult: The Role of Attitudes and Perceptions of Diversity. Perceptions that lead to subgrouping can override the positive effects of diversity (Astrid C. Homan and Karen A. Jehn). 19The Hero's Journey: Helping Inflexible Groups—and Inflexible Facilitators—Get Unstuck. Use the Hero's Journey as an analytical and facilitation tool to help groups and facilitators get out of difficulties (Carol Sherriff and Simon Wilson). 20 Difficult Groups or Difficult Facilitators? Three Steps. Facilitators Can Take to Make Sure They Are Not the Problem. Facilitators can unknowingly contribute to the difficulties their group’s experience (Glyn Thomas).